Hey Lovelies! It’s Thursday again and that means time for a new DIY. Is it too early to make Halloween decorations already?! Oh well, you can never start early enough xD. But you can use this one as fall decoration as well, so who cares xD. Today we are going to make a pumpkin ghost. It’s cute, believe me. ♥ Yarn, in Orange, Black and Green. (…) = Repeat the space in brackets the given number of times. […] = Total number of stitches. 16: (1SC, dec) 8 times. Stuff the Pumpkin here. Fasten off and leave a very long tail. Use this tail to go through the middle and around, and pull tight to get those parts of the typical Pumpkin look. you can do this as many times as you want, I did about 8 times. Start with the color Orange. You start each row with 2CH, this counts as the first DC. Use SlSt after every row to go to the next ch space. Change to the color Green. Fasten off and weave in tail. Start with the color Green. Change to the color Black. Change back to the color Green. Sew the granny square to the bottom on the pumpkin. 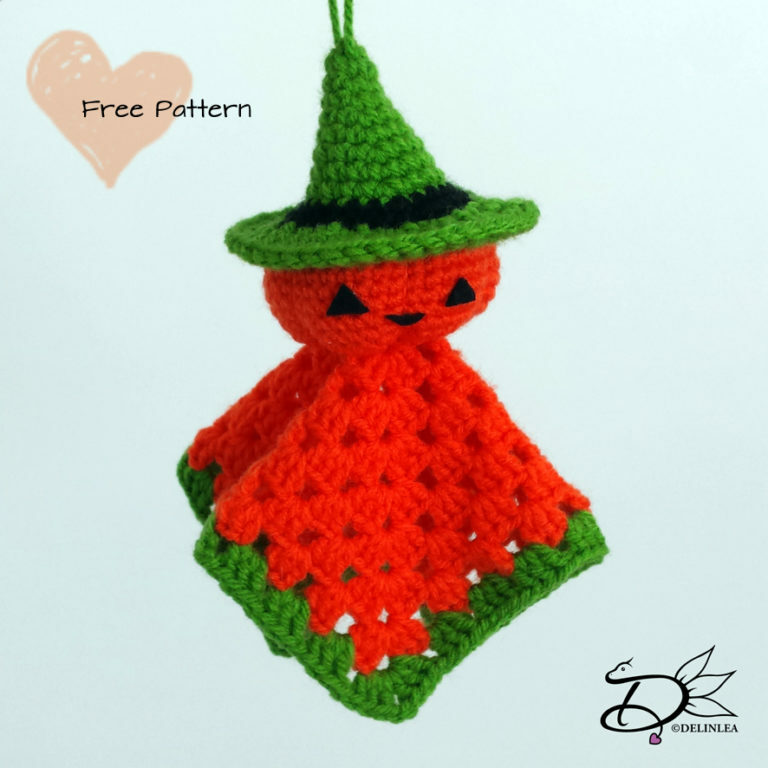 Make a loop on the witch hat and place the hat on the pumpkin, if you are happy with the look, sew it on. Cut some eyes and mouth out of black felt en glue this on the pumpkin. And you are done!! I hope you enjoyed this pattern. This will be a series of 3, so, look forward for the other 2. And don’t forget to show me yours if you made it, use the #DelinleaDIY on instagram or twitter! Hey Lovelies! 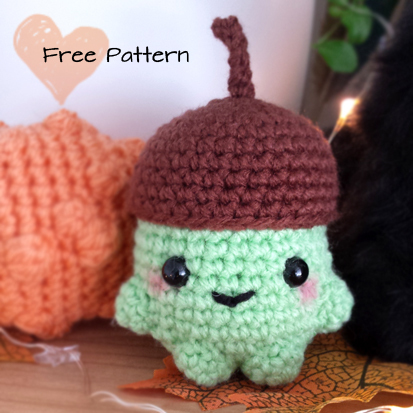 It’s time for another Amigurumi for fall!! Are you getting tired of me already?! haha well you have to bear with me for some time. Today we will make a adorable Acorn. I hope you will like him. ♥ Yarn, in Dark Brown, Light Brown or Greenish. Use a Greenish color or Light Brown. 19: (2SC, dec) 6 times. Insert the eyes between row 10 and 11, and stuff the body here. Use a Dark Brown Color. Use the same color as the body. Fasten off and leave a long tail for sewing. Use the same color as the hat. Sew the stem to the Hat and put the hat on the body, you don’t have to sew it on, but you can if you want. Place the arms and legs, using sewing pins, so you can still move them around easily until you are happy. Then sew them on. With some black thread you can sew on a mouth and add some blush on the cheeks with make-up or Soft Pastel. And you are pretty much done! 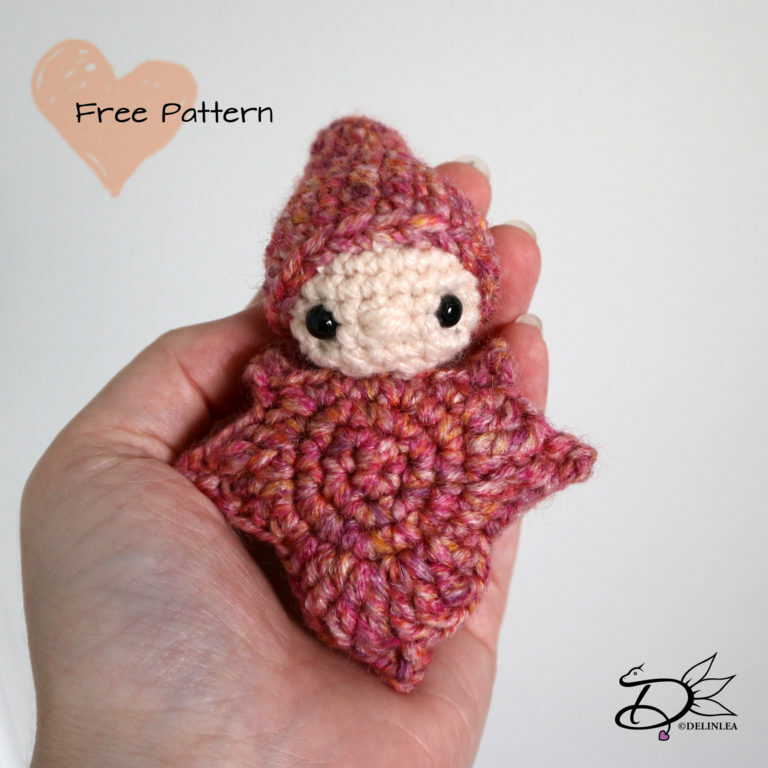 I hope you enjoyed making this pattern! And if you did, I would love to see yours! Use the #DelinleaDIY on twitter or Instgram! Hey Lovelies! As you probably know by now, I love fall! I think it’s my favorite season of the year! (But I love winter as well.. hmm) So today another Amigurumi for fall but this will work for Halloween as well, can’t start early enough with decorations, right?! SO, Let’s go~~! 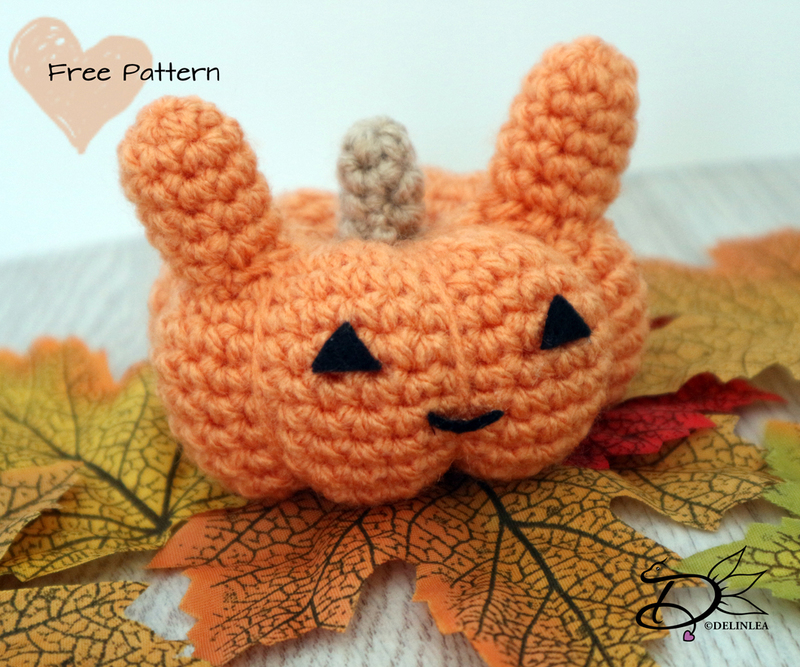 Let’s make this Amigurumi Bunny Pumpkin! ♥ Yarn, in Orange and Light Brown or Green. In Light Brown or Green. Sew the stem to the pumpkin, in the middle. Now position the ears with some sewing pins, place them slightly to the front, and when you are happy, sew them on. Now cut out some eyes and a cute mouth out of felt and glue those on! Hey Lovelies! I am so sorry that I didn’t upload a blog last week! It was my birthday and so many other things were going on. I just had no time to make something for you! 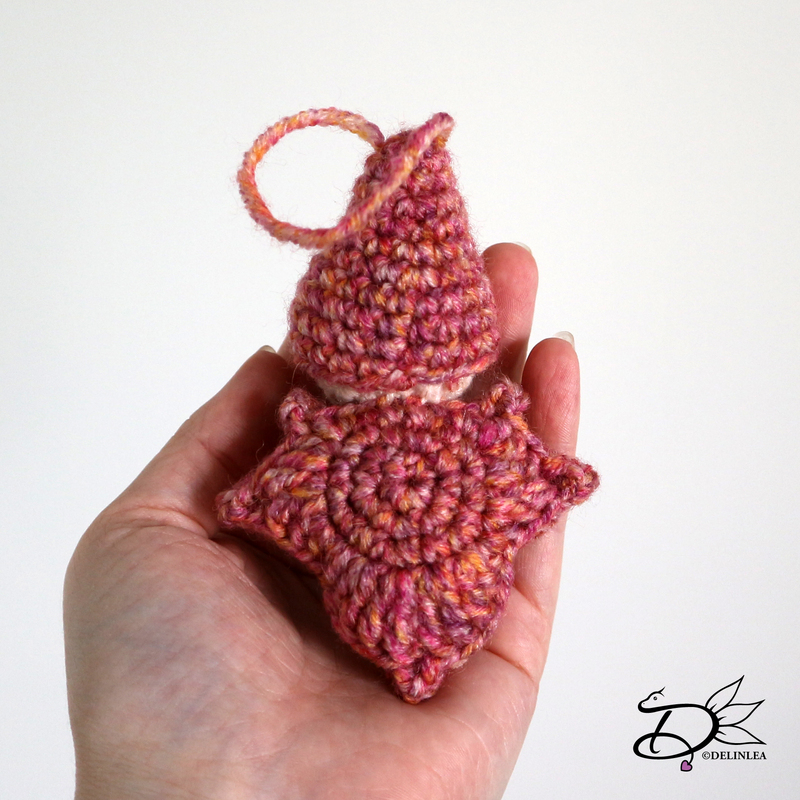 But today I do have something cute for Autumn! I can’t wait for Autumn to start tho! haha well rain started and it’s cloudy, but the temperature is still to high to feel like fall >_< I’m way to excited for the weather to cool down. To get into the autumn spirit already, let’s make this cutie~! ♥ Safety Eyes, 6 mm. HDC = Half Double Crochet. In a Fall color you prefer. Fasten off and leave a long tail for sewing on one of the 2 leaves. 10: (1SC, dec) 6 times. place the eyes between row 7 and 8 and stuff the head. Use a Fall Color for this. Sew the 2 leaves together, make sure you stuff it lightly before fully closing. Then sew the head on to the leaves, where normally the stem would be. When done, also sew on a nose inbetween the eyes with the same beige color. I hope you enjoyed this pattern!